In order to kick someone from your webinar, you must have moderator rights. As a host, you automatically have those rights. You can then click on the three little dots next to a profile either on the chat or the people tab. This will display a certain number of options in which you will find "Kick [Name]". Just click to ban that person from your webinar. They will be disconnected from the webinar and won't be able to log in again. Note: you can "unkick" someone by clicking again on the same button again. Same thing here, just pick a different option in the dropdown next to a message or a question in the questions tab. You've submitted an answer to a question, but you'd like to edit it for numerous reasons, an overlooked type, missing information, etc. Easy, just click on the three little dots next to the question and choose "Edit answer". Why are there participants in the room even though I have not started the webinar? 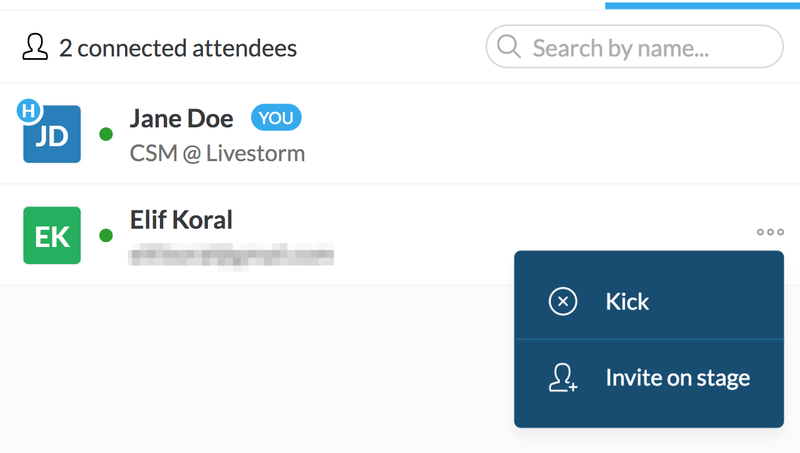 Sometimes, before you start the webinar, you will see people connected to the room, but don't worry they cannot access the room or see you. If they have the green dot next to their name, they are connected and on the waiting page. If the dot is gray, they are not connected. They have connected at least once to the webinar, fall on the waiting page, and closed the window.